On April 1, the military draft of the Russian Federation will begin. While thousands of Russian males are tempted to dodge regular service, the Kremlin Regiment has no such shortage of candidates applying to join the ranks of elite soldiers in the Kremlin Regiment. The criteria for joining the regiment, however, are very selective. The Kremlin Regiment is a military unit that is unique and elite in every respect. The regiment is responsible for the protection of government officials and subjects of the Kremlin. In addition, it is the original “visiting card” of Russia: every day, hundreds of Russians and foreigners visit the Eternal Flame and the Tomb of the Unknown Soldier, where the Kremlin’s soldiers carry out their duty. The regiment also appoints the honor guard for meetings with foreign delegations. Naturally, not just anyone can be part of this regiment; the selection process stretches out over several months. The list of successful new recruits to the Kremlin Regiment is usually prepared twice a year, by April 1 and Oct. 1. Those wishing to join the regiment must submit their candidacy at the draft board, where hopefuls can offer their service if they meet all of the selection criteria. The application window opens in February and closes on the first of April, after all the numerous documents and interviews with recruiters have been completed. One hundred eighty-five men from the Volga region, the Urals and Western Siberia are due to join the Presidential Regiment this coming spring and summer. In theory, the path to Red Square is not closed to conscripts from other regions in Russia. However, as it happens, the living quarters in the old building of the Arsenal is traditionally home to men from the Russian provinces. Recruits from Moscow are fairly rare, it seems, on the grounds that service close to home may be more of a hindrance than a benefit for a soldier trying to perform his duty. The recruits from Tatarstan, the Altai and Krasnoyarsk regions, as well as from Novosibirsk, Chelyabinsk, Kemerovo, Omsk and Tomsk –all of whom will soon be trying on their shoulder patches emblazoned with the letters “PP” (the letters stand for “Presidensky Polk,” which is Russian for “Kremlin Regiment”) – will not be tempted to run back to their hometowns. For them, home issimply too far away. Nevertheless, the geographical aspect is far from the main criteria in the selection process for soldiers of the Kremlin. 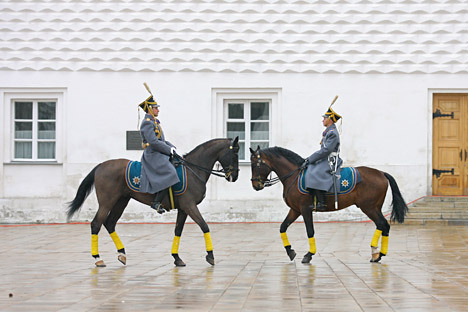 The Presidential Regiment, as it is also known, belongs to the Federal Protective Service, and the requirements for even privates at entry level are extremely tough. It is actually much easier to get into the army’s Special Force Unit than it is to make it into the “Special Forces” of the Kremlin. For example, there are no recruits from single-parent homes or disadvantaged families. Amongst other “taboos” are outstanding or withdrawn criminal charges, or any problems with the police. If before entering the army the individual is under investigation or has been registered at any mental institution or drug rehabilitation clinic, thenservice in the elite section is out of the question. When the regiment officers examine the personal details of a conscript, they also pay close attention to any relatives who live abroad or have criminal convictions. There is really nothing to be done about it: the specifics of the Presidential Regiment require such attention to detail. There are even special requirements regarding the health and appearance of an elite soldier. On the military unit’s website it states that the applicant must measure between 5 feet 7 inches and 6 feet 2 inches, with a visual acuity of no more than 0.7 dioptres in both eyes and normal color-sensitivity. The soldier’s BMI (i.e., ratio of height to body mass) is equally important; if a soldier measures5 feet 9 inches from head to foot, for instance, he must weigh no more than 154 pounds. Kremlin hopefuls must also take a hearing test. If they can make out a whisper from 19.6 feet away then they are fit for service in the Presidential Regiment. If they miss any words, they will find themselves in a different military unit. In addition, there is no place in the Kremlin’s line for those who enjoy alcohol or have tattoos, which are currently fashionable among young people. As for the stories suggesting that the Presidential Regiment only takes men with a Slavic appearance, upon inspection these rumors seem to be untrue. Certain subdivisions do take into account the soldier's physical features, but, on the whole, appearance is not of great importance.